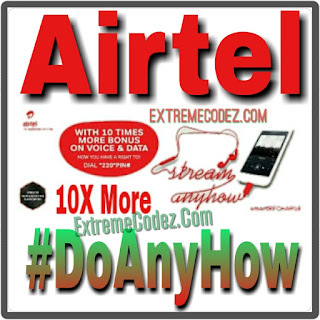 Airtel has introduced a new package called smartRecharge tag as (#DoAnyHow), it's a new offer from airtel Nigeria that gives you 10 times more on your recharge for voice and data. This package is better than the Airtel smart connect 2.0 that gives 6x more on the amount you are recharging and Airtel overjara smartconnect 4.0 that gives 8x more on the amount you are recharging. Without any further ado, the new Airtel SmartRecharge offers you 10 times value (bonus) on your recharge amount. With smartRecharge we give you 10times more on your recharge value for voice and data! Now you have even more to Stream. Dance. Sing. Dial *220*PIN# to recharge and get your bonus today! You are confused about it? Don't worry, we are going to put you through by showing you how it works and how to activate airtel 10x bonus. Airtel SmartRecharge, if you recharge N100, you’ll get N500 for calls and N500 for data. Now, If you recharge N200, you get N1000 for calls and N1000 for data. N500 recharge give N2000 for calls, N3000 for data plus extra N3000 for data. Also, if you recharge N1000, you get a massive N2500 for calls, N7500 for data plus extra N7500 for data. As you can see, you get more voice and data bonuses the more you recharge. Interestingly, this offer is open for all Airtel subscribers both new and existing customers. HOW TO ACTIVATE OR GET AIRTEL SMARTRECHARGE BONUS? Just dial *220*Rechargepin# and send, to get your own bonus. Don't forget to share this post by using any of the below share buttons and also tell us your view about the airtel smartrecharge. On Airtel SmartRecharge, if you recharge N100, you’ll get N500 for calls and N500 for data. If you recharge N200, you get N1000 for calls and N1000 for data. N500 recharge give N2000 for calls, N3000 for data plus extra N3000 for data. However, if you recharge N1000, you get a massive N2500 for calls, N7500 for data plus extra N7500 for data. As you can see, you get more voice and data bonuses the more you recharge. How long does the bonus last pls?